This week we've got some big changes to the wilderness as well as the start of the Last Man Standing open beta! Untradeable equipment in the wilderness can provide some impressive bonuses. Previously, untradeable equipment also came with little to no risk. If you die with untradeable equipment to another player within the wilderness, you will still be able to run back and pick back up your untradeable gear. However, when you pick it up it will be broken. Broken untradeables cannot be equipped. Broken equipment has a repair option which can be used in order to make your equipment useable once more. Repairing an item requires coins in your inventory, and the amount of coins required to repair each item varies. If you click the repair option, you will be given a confirmation box letting you know how much repairing your broken item will cost. Once you confirm the repair cost, your item will return to its original state. If you kill a player in the wilderness who is using untradeable equipment, you will receive 75% of the repair cost for their untradeable items. This makes killing players who are using untradeable gear much more rewarding, while also making using untradeable gear a bit more costly. Untradeable equipment will still be converted to coins upon death past level 20 wilderness. Do not risk untradeable equipment you are not willing to lose past 20 Wilderness. Much like with last week's update, world 317 is now a Last Man Standing beta world. However, this week all Old School members have been given access to the minigame! We also received a lot of useful feedback from last week's beta. Over the last week we have implemented a number of changes to the minigame based on this feedback. The biggest point of feedback we saw last week was that players don't want the entire Last Man Standing minigame to be multi-way combat. As a result, we have made the entire minigame single combat for this beta weekend. While we still have our concerns about players potentially using boxing to win games, we want to see how the single combat minigame compares to the multi-way combat minigame. If the minigame is a more enjoyable experience overall, we'll do what we can to make it viable for the final release. We've also implemented the PvP world PJ timer into the minigame as a part of this change. Throughout the Last Man Standing map you will now find vending shrines. 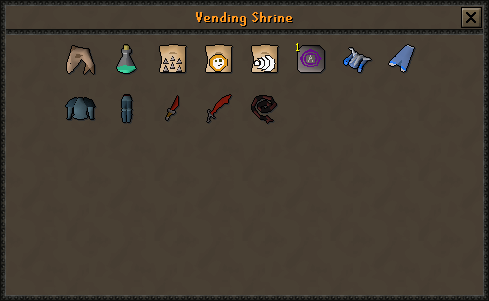 You can sell your gear and supplies to vending shrines in exchange for tokens. If you're able to get your hands on enough tokens, you can purchase various pieces of equipment from the vending shrine. This addition should ensure that everything you loot in Last Man Standing is of some value to you. Whether it is loot from a kill or from a chest, you'll be progressing in some way. Looting chests now comes with a short delay. This means that being the first to a set of chests will not guarantee you walk away with all of the loot. A small one square advantage will no longer make or break the game. We've also added more lootable containers throughout the map. Spawning into Last Man Standing will no longer place you in the same spot as everyone else. You and your competitors will be much more spread out at the start of the game. When you kill another player in Last Man Standing you will now receive a bloody key. This key can be used to re-loot a container which has already been looted. You will have a higher likelihood of receiving food or potions when using a bloody key to loot a container. Prayer is one of the most valuable resources in Last Man Standing. To help balance things out for everyone, and to prevent a few players who get prayer potion drops from completely dominating, everyone now starts with 10 prayer points. We've also added the ability to use quick prayers to the minigame. At 4 minutes, 6 minutes and 8 minutes in a game of Last Man Standing, monsters will spawn at a random location. If you kill these monsters you will receive food as a drop. You can now sacrifice your birds nest eggs to the shrine found in the Woodcutting guild in exchange for seed nests and a small amount of prayer experience. When sacrificing eggs at this shrine, there is also a very slim chance of receiving a piece of the cosmetic evil chicken outfit! This outfit is tradeable. 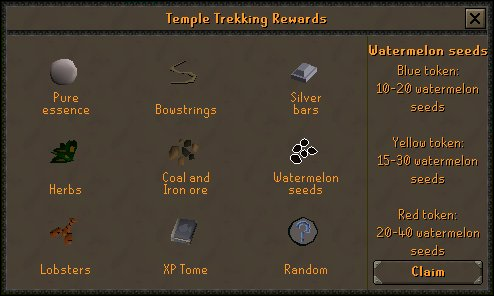 Temple Trekking now gives you the ability to choose which reward you would like to receive. It is also now possible to claim your rewards direct from the token without having to hand them in. If you're a fan of Temple Trekking, now is the time to stock up on XP tomes! 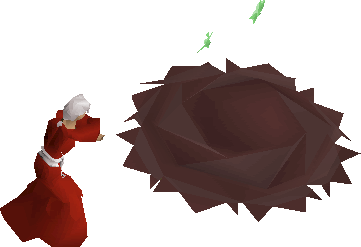 The elder chaos druids found by the chaos altar in the wilderness now have a slim chance of dropping elder chaos robes. These robes require level 40 Magic to equip. Elder chaos robes provide best-in-slot magic attack bonuses for players with 1 Defence. They are sure to be of great use to pures and will definitely make elder chaos druids worth a visit! The Bounty Hunter overlay displays a skull which shows how much your opponent is risking. Previously, this was based on the alchemy value of the items they had equipped. Following today's update, these skulls now use Grand Exchange value of both items found in your opponents inventory and those they have equipped. These skulls should now be much more accurate, and will give you a much better idea of how much your opponent is risking. A small icon has been added to the Bounty Hunter overlay which can be used to skip a target. STASH units are now listed in the Construction skill guide. The Ancient Cavern STASH unit has been moved to a better location. The STASH unit in the Watchtower will now also store the Bullroarer. Obsidian weapons have been added to the in-game skill guides. It is now possible to store the female variants of the pink and gold elegant clothes in your PoH treasure chest. Arclight will now damage vampyres in the same way that Darklight and Silverlight do. Using a canoe on a free-to-play world will now display the cutscene displayed in members worlds. The tithe farm minigame teleport can now be used outside of Zeah. Players who have completed the elite Wilderness diary can now toggle whether or not lava dragons will drop noted bones by talking to the diary master. The geomancy spell will now show the correct yield from the Belladonna patch. STASH units can no longer be interacted with on non-members worlds. You can no longer enter a wall in the Monkey Madness II cavern. Corrected some grammar in the Wanted! quest journal. Corrected some spelling in dialogue with Lufubu. Fixed an issue where health bars would not always display correctly. You can no longer open treasure trail caskets in the King Black Dragon instance. Soon 1 yr since we got max cape, will we start discussing comp cape anytime soon? would be nice to have it 1 yr after max. Also when is the poll dev blog coming out? which pets will we see polled? agil, thief? 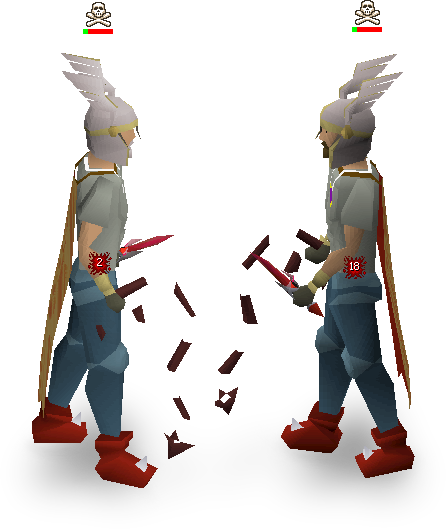 can you please make fire cape and max fire cape same price when repairing them? Is graceful clothing included in untradeables in pvp update, if so can you let me know cost of repair? Also, how about rc pouches? Why is there no list with prices of untradeable items?